Bamboo is taking the interior design world by storm and for good reason. It’s quickly becoming one of the most sought after flooring options for your office or your home. Even though it’s made from a type of grass, it is just as durable as hardwood flooring and has many of the same properties. Knox Carpets has an abundance of options, but we want to ensure you understand why we’re so excited about them. The first benefit of bamboo flooring may be the most obvious– it’s ecologically friendly. In some cities and states you can even receive tax credits because of this choice. Bamboo is made from natural vegetation. It’s a resource which is highly renewable. From birth to full maturity, it grows in as little as three to five years. To compare? Hardwood trees can take more than twenty years until they reach their full maturity. We believe that being environmentally conscious is timeless but you’ve probably noticed even more than usual that it’s particularly trendy right now in the construction industry. Consumers are noticing this. They’ve begun to demand the products that reflect these values that are increasing in importance. Another big trend right now is choosing materials for your home that reflect YOU and your individual personality, instead of the cookie cutter designs at your neighbors. It’s also very easy to maintain. No need to take it easy, you can sweep or vacuum as you normally would, you’ll be able to remove small particles of debris with ease. You can mop it, you can clean with a sponge for tough stains, you can even use non-wax, non-alkaline cleaners as you would on hardwood. If you’re worried about this, there is a huge range of bamboo specific floor cleansers out on the market. 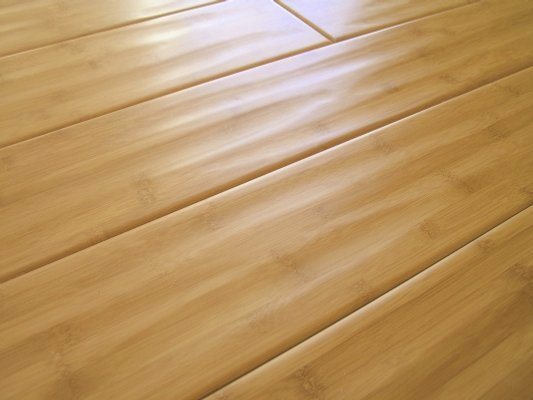 It’s important to note that bamboo will become scratched or marred over time, due to general wear and tear. However, luckily it can be easily refinished. Simply by sanding it down and reapplying a finishing coat, you have a floor that’s good as new. Although it is still a concern, warping, damage and stains are much less common on bamboo flooring than they are on hardwood. Bamboo is just much more resistant than hardwood to the effects of these. Bamboo can be extremely hard, strong and durable. Look for natural un-carbonized bamboo that has been properly harvested and manufactured– these options can be as durable as the wood from a red oak. Bamboo that’s strand woven can be manufactured to be even stronger than that. Price is frequently an issue when you’re comparing different types of flooring. You want to ensure that you’re making a wise investment without spending too much money. Bamboo runs the gamut. Bamboo ranges from two dollars a square foot to eight dollars a square foot. Make sure that you avoid bargain basement materials, they’re frequently castoffs or imitations. Be sure to check out our extensive variety for multiple options to use in your house and take your home to the next level.